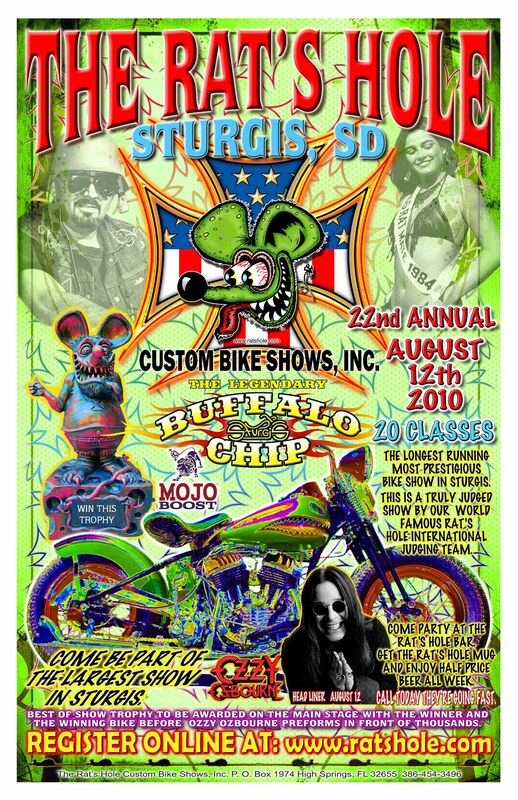 It’s time for Sturgis and the 22nd Annual Rat's Hole Custom Bike Show. "The Buffalo Chip is the new home of the Rat’s Hole for the next 6 years," said Ted Smith, owner and producer of the world famous bike show. "This will be the largest show in Sturgis and the Best of Show will receive his award on the main stage before Ozzy comes on stage in front of thousands of cheering fans." Fans from all over the world come out to share good times with Ted & Pam Smith and the Rat's Hole Gang. "We will also have a Rat’s Hole Bar and you can pre buy a collector mug at 386.454.3496 and receive half price beer all week long at the Buffalo Chip," said Ted. 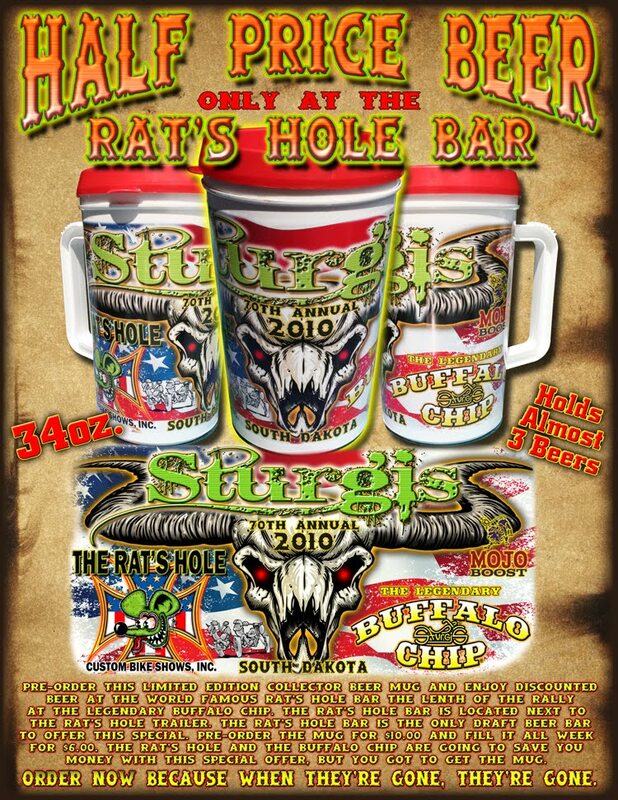 You can also get your Sturgis Mugs at the Rat's Hole eBAY Store. The Rat's Hole Bar will be the only place serving draft beer. the mugs are double-insulated and hold draft beer equal to 3 cans... perfect to avoid consession lines at concerts. 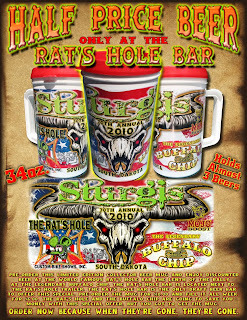 The mug will be picked up at the Rat's Hole Bar at Buffalo Chip and comes with the first "fill up." To pre-register a bike in one of 20 Classes, go to ratshole.com. Ozzy will cap off this year's music at The Buffalo Chip! Immediately after the World Famous Rat's Hole Custom Bike Show, Ozzy Osbourne will take the stage to cap off this year's Biker Music Festival at the Legendary Buffalo Chip. Ozzy Osbourne, the hipster of dark thoughts and dark music was lead vocalist for the British heavy metal band, Black Sabbath in the '70's before becoming a multi-platinum solo artist. "The Buffalo Chip is offering more activities, more exhibits and shows than ever before," said Ted, who agreed to bring his big show to the Chip as soon as a large enough paved staging area became available. The music lineup includes ZZ Top, Kid Rock, Motley Crue, The Doobie Brothers and The Scorpions. You will also be able to see Michael Lichter’s 10th Annual Motorcycles as Art exhibit, entitled "Eternal Combustion - 30 in the Wind" that explores the explosion of interest and passion for custom motorcycles. The exhibit features the work of 30 custom builders. To check out the music lineup and find special deals on camping for Sturgis Bike Week 2010, visit the buffaochip.com.